HTC Tweets One Mini Teaser, Reveal Set for Tomorrow? It would appear that the time has finally come for HTC to officially unveil the One Mini. While the device has been seen plenty of times and we pretty much know everything there is to know, it’s about darn time. 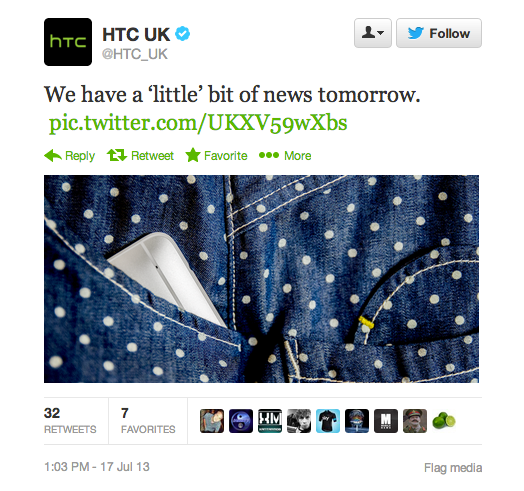 The official HTC UK Twitter account states that the OEM “has a ‘little’ bit of news for tomorrow,” July 18. In the picture, we can clearly see the Mini and its white trimmed edges inside of a pocket. So, there you go. From the most recent reports, the One Mini is said to sport a 4.3″ 720p display, BoomSound, an UltraPixel camera, a dual-core Snapdragon chipset, 1GB of RAM and 16GB of internal storage. All of the device’s specs will be confirmed tomorrow if and when the Mini is announced.